Yohannes Christian John (born September 14, 1979 in Banjarnegara, Central Java, Indonesia) is an Indonesian professional boxer, and the current WBA (Super) featherweight champion. 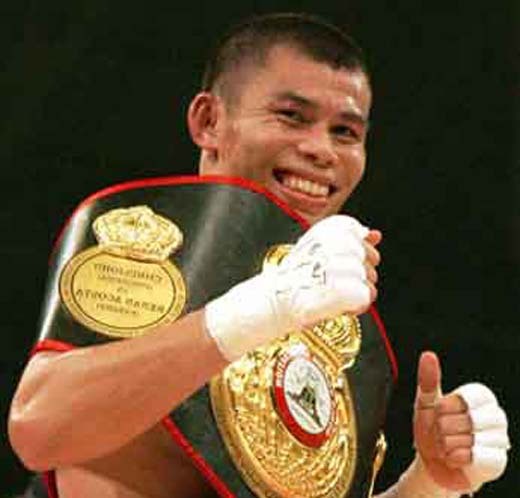 John is the third Indonesian to win a boxing world title, following Ellyas Pical and Nico Thomas. John started boxing in his early childhood and was trained by his father Johan Tjahjadi (aka Thjia Foek Sem), a former amateur boxer. John turned professional in 1997 and is known as "Thin Man" before he proclaimed his new nickname "The Dragon" that he uses until today. In 2005 John split with trainer Sutan Rambing then joined Harry's Gym in Perth, Australia, where he is currently trained and managed by Craig Christian. In the year 2008, Chris John was interviewed by ESPN and he stated that he will fight another 5 or 6 fights and will retire. Should he do so, he will be rated amongst the most anonymous world champions in the history of the sport, primarily due to his unwillingness to fight outside Indonesia and his unwillingness match up against the top ranked fighters of his day. On October 24, Chris reached and won his 10th milestone world title defense fight, which was also his 5th mandatory fight, against Japan boxer Hiroyuki Enoki in Tokyo, Japan. On February 28, 2009, Chris John again staked his world title against Rocky Juarez in Toyota Center in Houston, Texas, which served as the main undercard for the Marquez-Diaz lightweight title bout. This was the first time he had fought on American soil. John seemed to take control of the fight in the middle rounds, but Juarez rallied to take the final two, resulting in a seemingly controversial draw. HBO's Harold Lederman and Max Kellerman both had the fight scored 8 rounds to 4 for Chris John. John had a rematch again Juarez in Las Vegas on September 19 and the fight was won by the Indonesian via a very clear 119-109, 117-111, 114-113, 12 round unanimous decision. John defended his title for the 13th time on December 5, 2010, by defeating Argentinian David Saucedo by unanimous decision.